Quarterback Russell Wilson and running back Marshawn Lynch are two of four players featured in EA Sports’ Madden NFL 25 official gameplay trailer, a title set to be released on Xbox One and Playstation 4 this fall. Wilson and Lynch are highlighted alongside 2012’s NFL MVP Adrian Peterson of the Minnesota Vikings and 2012’s AP Offensive Rookie of the Year Robert Griffin III of the Washington Redskins. It’s pretty good company for the pair of Pro Bowl Seahawks who were the backbone of Seattle’s offense last season. In the trailer, Lynch and Wilson are showcased in several sequences of virtual footage at Seattle’s CenturyLink Field. The NFL quad of Lynch, Wilson, Peterson and Griffin are clearly the focal point of this video, but it’s former Detroit Lions running back Barry Sanders who will don the game’s cover, after garnering more than 40 million total votes throughout Madden 25’s “old school” vs. “new school” cover-hopeful campaign. Sanders beat out Peterson in the championship round of voting. The Browns’ selection of Barkevious Mingo with the sixth pick overall in last month’s NFL Draft has prompted the folks at NFL.com to compile a photo gallery of the NFL’s all-time all-name team. The fullback is Mack Strong, the former Seahawk whose parents must have known he was destined to block for three 1,000-yard rushers during his 15-season stay in Seattle. But Strong was more than just a lead blocker. Only Joe Nash (218) has played in more games for the Seahawks than Strong (201) – and both made the team as rookie free agents; Nash in 1982 and Strong in 1993 (he spent his rookie season on the practice squad). No one won the Steve Largent Award more than times than Strong (five). He also was voted to two Pro Bowls, selected All-Pro in 2005 and named to the Seahawks’ 35th Anniversary team. Also on the all-time all-name team: offensive lineman Floyd “Pork Chop” Womack, who played with the Seahawks from 2001-08; long snapper Trey Junkin, who was with the Seahawks from 1990-95; and safety Atari Bigby, who spent the 2010 season with the Seahawks. Pete Prisco has his annual list of the Top 100 players in the NFL at CBSSports.com, and guess who checks in at No. 9? Marshawn Lynch prefers to let his actions speak for him. And when you’ve rushed for 2,794 yards and scored 25 touchdowns the past two seasons, that’s a prolonged – not to mention productive – conversation. Lynch generated discussions of a different kind on sports-talk radio last week by his absence when Phase 2 of the Seahawks’ voluntary offseason program began. But he’s back, and his teammates let him hear it when Lynch arrived midway through Monday’s on-field session. But today Lynch was back where he belongs, and the team needs him: In the backfield, carrying and catching the ball. In an early drill, Lynch came out of his stance, juked around a trashcan and took a short pass from backup QB Brady Quinn. Later, Lynch took a handoff from QB Russell Wilson and darted between All-Pro center Max Unger and guard John Moffitt. The All-Pro back punctuated each maneuver with a smile. May the 4th be with you… always. It is May 4th and as appropriate on this day, dare we say … May the 4th be with you! To spell it out for the percentage of us born after the rest of us discovered (for the second time) that Anakin Skywalker was, in fact (SPOILER ALERT), Darth Vader, this phrase is a play on words to the Jedi credo (not to be confused with Greedo – RIP): “May the force be with you” as made popular by the Star Wars films. That all being said, Happy Star Wars Day, 12s! Richard Sherman as Boba Fett: First things first … Boba Fett didn’t die in the mouth of the Sarlacc. Tortured? Yes. But he does escape. (And this better be addressed in Episode VII, so help me.) 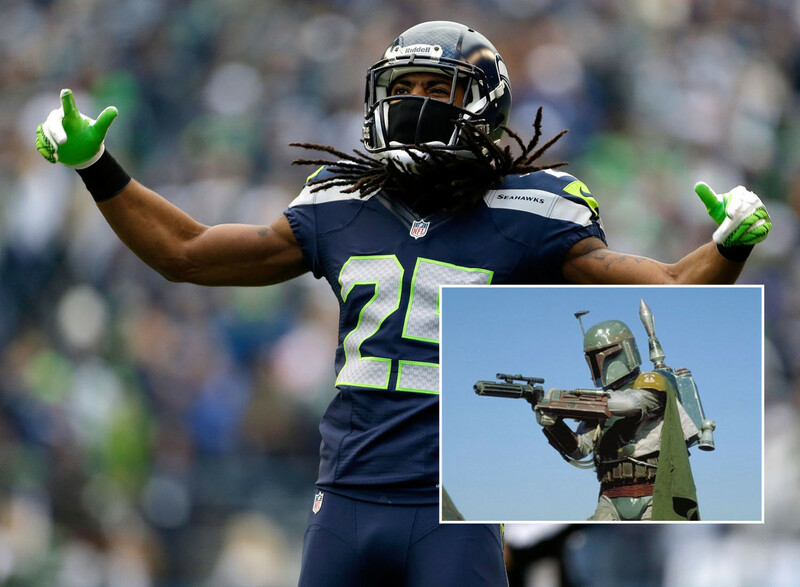 But when I think of Fett as an NFL player, I can’t help but think of Richard Sherman. Both are trash talkers and always seem to get their man. Fett was an unexpected hero of the Star Wars universe (which George Lucas realized and is why Jango Fett and his son have such a huge storyline in “Star Wars: Episode II – Attack of the Clones”). And likewise, Sherman is becoming one of the most famous (infamous?) players in the NFL. Comments Off on May the 4th be with you… always. The Seahawks already have one player in the NFL Network’s Top 100 Players for 2013 and they’re about to get another. Players No. 90 through No. 81 will be profiled Thursday in the weekly series, which starts at 5 p.m. PT. We know who that player is and where he’s ranked, we just can’t say. But make sure you tune in early to see who it is. Among the candidates: All-Pro and Pro Bowl free safety Earl Thomas, All-Pro and Pro Bowl running back Marshawn Lynch, All-Pro cornerback Richard Sherman, recently acquired receiver/runner/returner Percy Harvin, Pro Bowl left tackle Russell Okung and Pro Bowl quarterback Russell Wilson. All-Pro and Pro Bowl center Max Unger? He was at No. 95 when the series kicked off Saturday following the conclusion of the NFL Draft. Unger was the Seahawks’ second-round draft choice in 2009. He started at right guard that season, becoming the first rookie lineman to start all 16 games for the Seahawks since Ray Roberts in 1992. Unger was back at right guard in 2010, but he got a season-ending toe injury in the opener. He moved to center – the position he had played at the University of Oregon – in 2011 with the arrival of line coach Tom Cable and has only gotten better by the snap.